Follow us on Twitter @VControlLab!!! Another long awaited module is being teased just in time for Knobcon this weekend. Qu-bit Electronix posted the new teaser video of their much anticipated EON module, a 2HP wide Envelope, Oscillator and Noise Generator. Packed into a 1 centimeter module, the EON is intended to be a power-packed case filler for Eurorack users. There isn’t much to hide on the EON, it’s pretty much all on the surface. There is a 3-stage switch to select between each of the modes. The Envelope is an Attack/Decay function with linear and exponential slopes, perfect for something like Kick Drum sound design (as shown in our recent Youtube videos using the Sputnik Oscillator and the Roland Aira modules) or the new ALM Akemie’s Castle (which is large but needs a few envelopes to wrangle it’s full potential). The Oscillator is a Square wave which can track 1 Volt per Octave or self-quantize to semitones for more traditional applications. As well, the EON can generate a Triangle wave LFO or other cycled Envelope shapes, which is another useful option. No word yet on whether the LFO or cycled Envelopes can oscillate at audio rates. 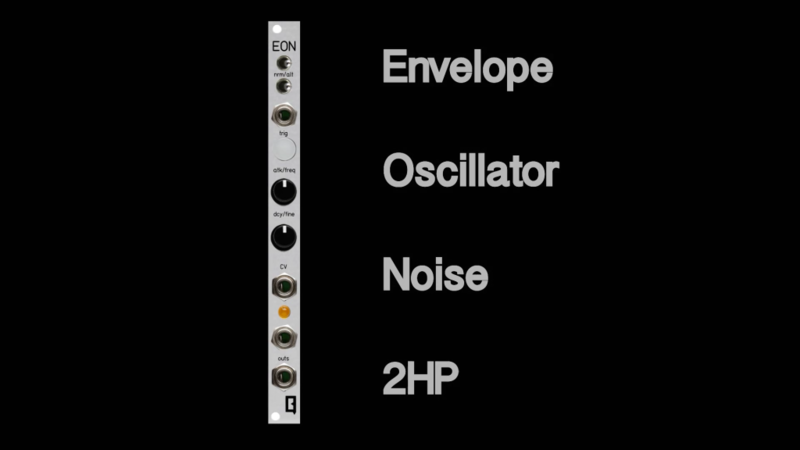 Finally, the N in EON stands for the down-sampling Digital Noise Generator that also resides in the module. The module can also send random gates, another extra feature that makes this a very powerful 2HP module. At $150 for pre-order on the Qu-bit site, the EON packs a lot of power into a tiny footprint. The device is clearly meant to offer a ton of features while fitting into the smallest hole in your case. Will you fill your last 2HP with the Qu-bit EON? Let us know in the comments! Wondering what a cycling Envelope is and why you’d want one? Check out our Modular 101:Intro to Eurorack course and find out!